Where You Always Save More Money! 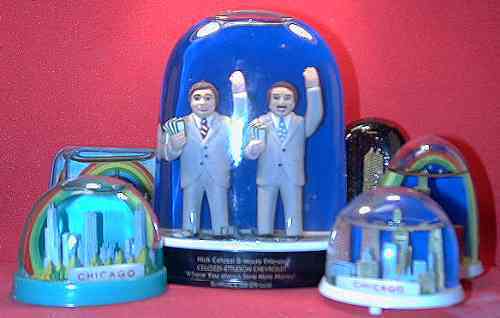 NICK CEL0ZZI and MAURY ETTLS0N were well known folks on Chicago televison. They sold Chevrolets to Chicagoland and they sold a lot of them. Their ads were low key, but they usually featured the pair holding a fistful of dollars that you could save by shopping with them. For a while, they offered their own snowdome! If you've not seen this dome in person, then you can't appreciate how HUGE it is! This has got to be the SUV of snow domes. SUV's, if you don't know, are the hugely popular trucks that we suburban Americans drive because they sit tall and high. Yes. These guys would ride high in the snowdome world.. 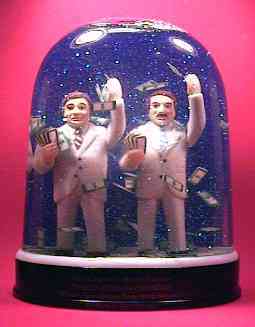 There's not enough plastic snow in China to fill a dome like this. Instead, they used plastic greenbacks! If this was not the largest snowdome in the free world? If not, it is the most free dome in the world. Yes. It was FREE! It was billed on their website as a freebie to anyone dropped by. Now I've had relatively few good experiences at car dealers. I am afraid I'll walk in and come out with another car. So I was dubious, but I eventually built up my nerve and went in. I looked at a $45,000 Corvette, which I knew I wouldn't buy, shook hands with a pleasant salesman and snuck out with this remarkable dome. Hee hee. As it turned out, the C-E folks even shipped a few domes to collectors who couldn't drive out. Nice guys. You can't get them anymore. The two dealers recently sold the dealership. I picked up a second dome last year. A neighbor found it for 50 cents at a garage sale.